Tong Zhengang was born in 1959 in the Kelamayi city of Xinjiang province. His ancestral home is Jilin Province and he worked as an oilfield worker, instrument worker, as well as a calligraphy teacher in Beijing Language University. 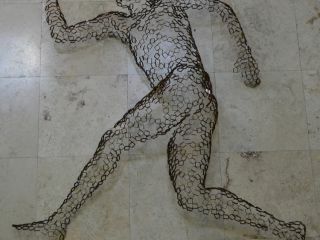 He studied at the Beijing People's Liberation Army Institute of Arts and Central Academy of Fine Arts. Tong engaged in the fields of calligraphy, seal cutting and Chinese ink painting in his early years and recently gained recognition for his unique painting style and talent in the world of contemporary ink painting. 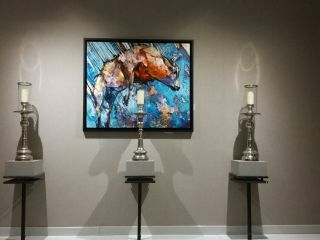 After 2000, he began the creation of contemporary oil painting and sculpture. 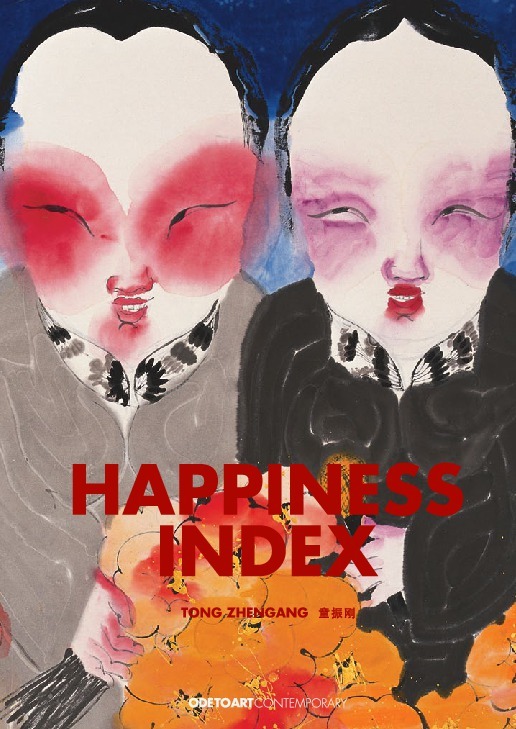 With the intention of making "playing art", Tong created a series of works such as "The Happiness Index," "Chitchat,: Uncooperative, Instability and so on. 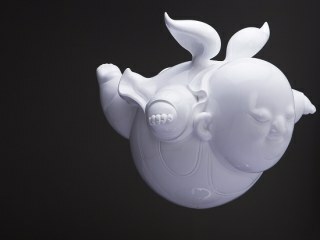 In the classification of Chinese contemporary artists, he is an example of having successfully achieved transitions in his art. His works were selected to be exhibited numerous times at the Moualot Lithoprint Factory and Lithograph Museum in Paris. He also had solo exhibitions in the Barcelona Contemporary Museum of Art, Spain and in Hong Kong, and the American Embassy in Beijing. 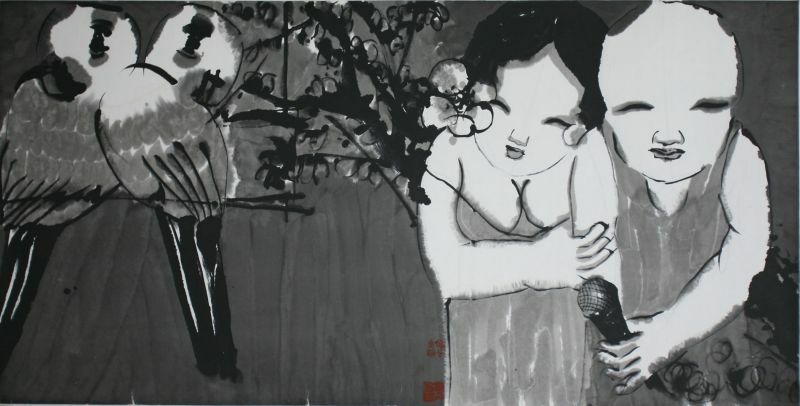 Tong expresses his feelings and understanding of the value and meaning of everyday life by depicting the female in the appearance of a portrait, or by placing the female together with a male in the same environment in order to establish an interactive relationship between his personal view and the objective view of the male. In Tong's works there is the attainment of an ultimate goal of artistic creation: freedom from issues of harmony in aesthetics, the conversion of art directly into the spirit of human life, and from that into art. The purpose of Tong's works is to serve as criticism, in order to change of the inner mindsets of people. His paintings not show only the difference in identity, but also criticize how people are differentiated by society. 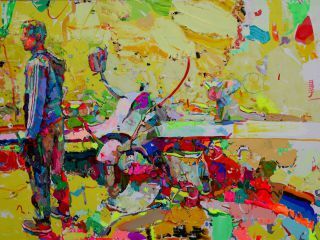 Reading Tong Zhengang's paintings from an academic viewpoint, it is undoubtedly essential to have a thorough review and comparison on contemporary art trends. Or else we can just immerse ourselves in the unique atmosphere that he builds in his works and nothing more. It would be prejudicial and limited if we simply define Tong Zhengang as a Chinese traditional ink painter, because his artistic career progressed from seal carving, calligraphy and then ink painting. 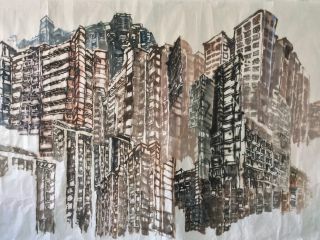 In his latest creations, Tong Zhengang has broken through the general concept of the creation of Chinese ink painting, no matter in terms of the materials used or the expression of ideas. What does it mean? First of all, let us return to the painting media that is called Chinese painting and its related languages as the starting point of this short article. As everyone knows, under the background of modern culture, there is a huge controversy which has lasted for a long time over what is Chinese painting. However, I think that in traditional Chinese painting, there are some basic elements that cannot be substituted by other formats of painting such as paper, pigments, the calligraphic brush stroke, poetic atmosphere, integration of poetry, calligraphy, painting and seals, as well as the ways of constructing the interplay of emptiness and substance, white and black, and the artistic conception of viewing vastness in a small painting. When doing research on the development of Chinese ink painting in the past two decades, people have undeniably noticed the transformation of ink painting based on these elements. 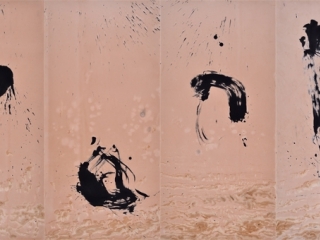 Specifically speaking, there are Gu Wenda's breakthrough in the concept of calligraphy and painting sharing the same origin, the new Literati paintings' experienced evasion from new trend art, and experimental ink paintings' divorcement and re-union of these basic elements, and so forth. There is a common understanding by art critics and painters that, compared to oil painting which is an imported art form, so-called Chinese ink painting has encountered much more serious challenge and chaos in recent years. Looking around widely,we can discover that, apart from the main forces of creation from civilian and official traditional painters as before, those who really want to enhance and glorify our national quintessence of Chinese culture in the broader view of present day are under more and more criticism from critic and creation groups.Perhaps, sticking to the bottom line of ink painting represents a voice in this disordered art field. Nevertheless, it is also fruitless to blindly return totradition or set the regulation and standard for tradition in advance. For the creation of artists, ideas are without boundaries, as is technique. Didn't Gilles Deleuze and Felix Guattari, contemporary philosophers in France, said that thought can rove around "thousand highlands"? Now, let us look at the case of Tong Zhengang see how he breaks through the turmoil to express himself. It cannot be denied that if we look back on Tong Zhengang'screative progress, his early works are deeply influenced by Chinese traditionalpainting. Yet what is worth noticing is, even in that period his painting hasalready carried vivid characteristics: from the paintings we can clearly seethe impact of composition of seal carving and movement of the knife. Also, wecan see the use of brush tip which contains the forceful feature of calligraphyin Han and Song dynasties, as well as the vigorousness of woodcarving blockprint and clumsiness of inscriptions on metal and stone bells. The most outstanding point is his full composition, which is the pursuit in Chinese painting theory of the so-called "so dense that even not allowing ventilation". His distinctive application of essential factors of traditional Chinese painting, state clearly that Tong Zhengang has already get out of the influence of inheriting relationship of certain painting schools. To all kinds of essential factors that composeChinese painting, he has his own unique feelings and understanding. We are afraid that it's difficult to make clear every small detail of Tong Zhengang's evolution of thoughts, but in today's condition that information is commonly shared and it goes without saying that he is affected by various types of art tides. Such point possesses significant meaning as regards our understanding of Tong Zhengang's experiments on paper material later on. Due to his comprehension and sensitiveness towards the charm of language of forms, Tong Zhengang was urged to start placing his interest on the breakthrough of traditional painting language at an early stage; afterwards he even boldly made noticeable experiments on painting languages. 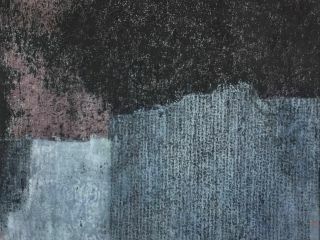 In the "Transmigration Series"and "Transformation Series" done in 1996, large amounts of acrylic pigment andprinting color were applied in experiments on paper and traditional Chinese medium. Some art critics believe that, initially when Tong Zhengangwas doing the creation of "New Literati Painting", he was good at showing thevitality of the calligraphic brushstroke, and did not confine himself to theaccuracy of the modeling of figures. This also states that he has alreadyrevealed his predilection towards painting languages in terms of form. Owing tothis special obsession, he accumulated a capability of form languages surpassing the transmission of contents in the following process of hispursuit. This is the reason for the strong visual impact from his recentcreation on paper - "Blue Series". Regarding Tong Zhengang as partial and sensitive to paintinglanguages of form does not mean he neglects the contents of paintings. Wouldrather saying that, if we over emphasize the symbolic contents of his paintingforms, it will result in the neglect of his experiments and explorations onpainting materials and the aesthetics characters produced. From Tong Zhengang's early and recent paintings, we can really see the elements of classical symbols, such as beautiful ladies, vases, screens and palace lanterns. We canalso see the elements of modern daily life, such as wineglasses with highstands, eyeglasses, and incandescent lamps. It will be too much prejudiced andliterary, if we point out their implied meanings in the painting in detail. The contemporary meaning of painting lie in its own charm of language forms; it is the outcome of the capacity and extension of visual languages. In the recent "Blue Series", the arrangement of scenery andfigures becomes more and more simplified. Yet, the use of color has offset themonotone created by such simplification - dark blue color has densely coveredthe sky range upon range, dragging the heavy body, rolling, gushing anddispersing everywhere; light blue mountains are also personified as big wavesgoing on and on. As distant views, they are full of rhythm of life. It is as if the starry starry night created by Vincent Van Gogh reappears on the paper of Chinese painting. 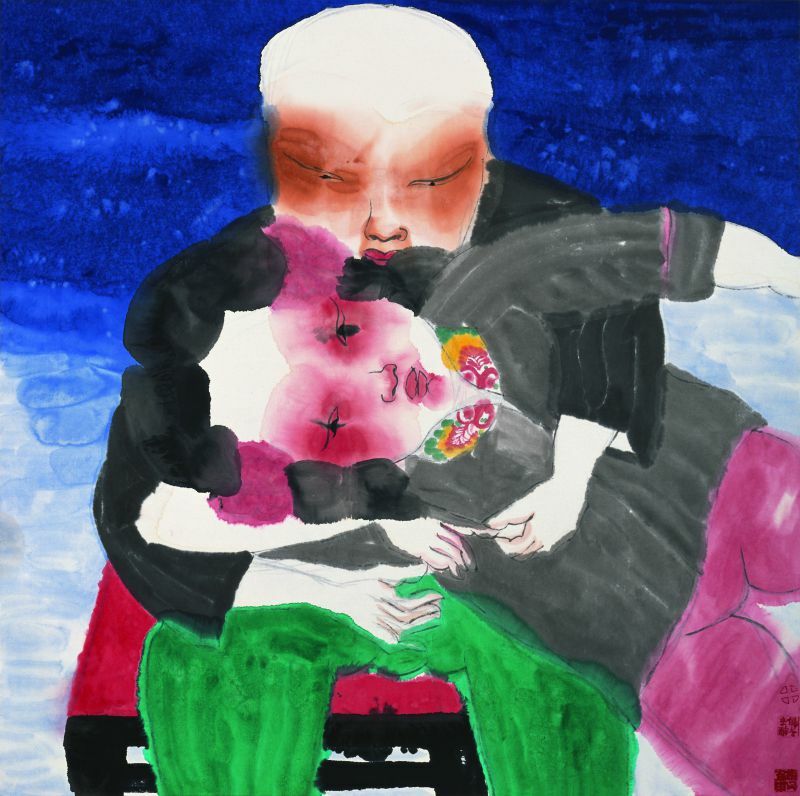 Other techniques used to express figures in the foregroundform a vivid comparison to the large-scale blue color: blushes on cheeks andeyelids of figures, rouge on their lips, and also half-opened sleepy eyes.These enable viewers to notice that, in his latest works, as always, Tong Zhengang still maintains his intense attention to the life state of human. The only difference is, the chilly and gorgeous beautiful elements constructed by modern ladies, green vases, window lattices and fan shapes have been replaced by men and women, the old and young clustered round by big flowers. The sky is so blue, thick and full of variations, filledwith all kinds of transitions. However for those people who are suppressed bythe sky, they appear to be dull, indolent, and even puzzled. This is a contrastcaused by visual form. Undoubtedly, the artist has an inexplicable unconsciousdirection behind such method of creation. 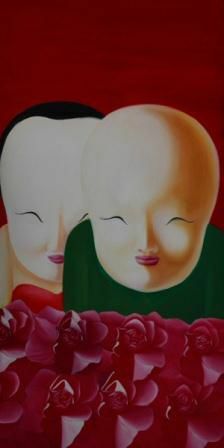 At least, we can see that theideology of green porcelain and rouged ladies in his previous paintings hascast shadows on his selection of several colors in recent paintings. Even so,this reappearance has already broken away from the literary traces that hisprevious creations have not eliminated. Only two to three simple color tones and striking compositions already fully illustrate the charm of form languages in paintings, carrying such information that: this is the times when is in vogue of mixed materialism, behind the wealthy life there is still an inexplicable confusion. Different from the previous paintings which through themutual blending of elements of all kinds of characters and patterns depictedthe feeling of feminized indolence; these new paintings emphasize theconciseness and originality of different kinds of elements. These enable viewers to taste the rich meaning of the images from the simplex and succinct visual images - we are in the time which is full of hopes and confusion,looking at these shocking pictures, everyone's heart must well up with deep feelings. Here, the artist uses his unique way to mold a portrait ofcontemporary people, which reaches their deep anxiety hidden in the innermostsoul. It is hard to achieve such an effect only depending on the reappearanceof the real objects and weaving of various kinds of elements. 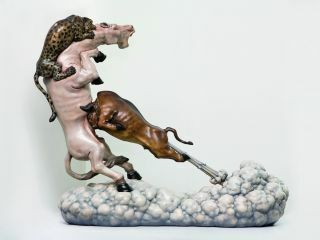 The indolence and giddiness under Tong Zhengang's brushesseems contradictory to his own heavy build. However, a number of writers havediscussed his relationship with females; thereby we can have a deeperunderstanding on the feeling of giddiness in his paintings. In fact, employing females as the main themes is merely the juncture that Tong Zhengang involves the secular life through painting. This becomes more and more obvious in hiscreation of painting recently. 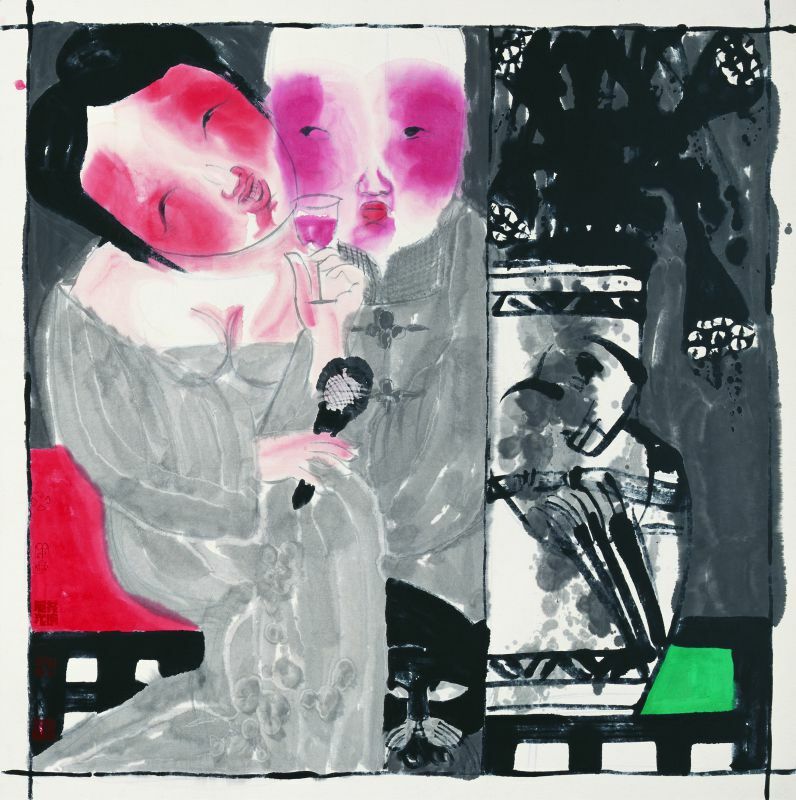 In other words, Tong Zhengang employs his own style (mostly images of female characters) to express his attention towards contemporary social life, reflecting his individual sensitiveness and understanding of painting vocabularies. 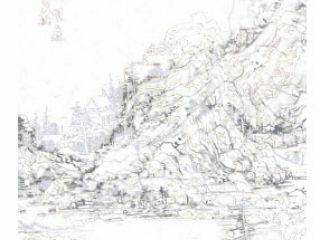 To derive nutrients from traditional art and boldly breakapart, polish, absorb, then add in fresh material, finally transforms hisparticular artistic expression, and enables Tong Zhengang's creation to veerfrom the limitation, contradiction and disputes of the trends of thought ofChinese ink painting in the past two decades. Then he advances to therearrangement of varied painting resources, readjustment of the active andpassive relations, and the feeling of pressing close to the selfhood andreality. Exactly for this meaningful reason, Tong Zhengang's artistic practice has paved a route for the development of people's thoughts on flat-surfaced paintings (here, it is no longer on the original level of Chinese traditional ink painting). The purpose of Tong's works is a criticism to the change of the inner mind of people. His paintings show not only the difference in identity, but also criticize how people are differentiated by society.